• On two-lane roads, vehicles traveling in both directions must stop. • On multi-lane roads with no barriers between lanes, vehicles traveling in both directions must stop. • On multi-lane roads with barriers between lanes, only vehicles behind the bus must stop. Barriers include unpaved spaces and raised medians. Drivers traveling in the opposite direction should proceed with caution. A three-week traffic enforcement effort that focused on drivers illegally passing school buses netted more than 60 violations, police said this week. Fort Wayne police issued 62 citations during the period, which ended March 22, Lt. Tony Maze said by email. Steve Stone of the Allen County Sheriff's Department reported his agency had two violations. Bus drivers with Fort Wayne Community Schools appreciated the enforcement, district spokeswoman Krista Stockman said. “We were really happy with how that turned out, and that they were able to bring attention to so many violations,” she said. Stockman watched as police pulled over drivers near Canterbury Green on the campaign's first day. Drivers' blatant disregard of the extended school bus stop arm and flashing red lights suggested drivers are ignorant of the rules, she said. State law requires drivers stop when school buses are picking up or dropping off children. In most cases, vehicles traveling in both directions must stop. On multi-lane roads with barriers between lanes, only vehicles behind the bus must stop. FWCS and Allen County's three other school districts are working together to bring awareness to the issue, perhaps through public service announcements, Stockman said. The dangers of illegally passing school buses was reinforced last year, when a 9-year-old girl and her 6-year-old twin brothers were killed in late October as they crossed Indiana 25 to board a school bus. The crash in Rochester also seriously injured a fourth student. State lawmakers this legislative session are considering a bill addressing school bus safety. The proposal includes stiffer penalties for drivers who illegally pass a school bus. Drivers failing to stop for school buses is a problem nationwide, according to data collected by the National Association of State Directors of Pupil Transportation Services. The organization has coordinated a survey on the topic since 2011. The 2018 results – which comprised counts from 38 states and Washington, D.C. – found 83,944 vehicles passed buses illegally on a single day during the 2017-18 academic year. About 108,600 school bus drivers participated. 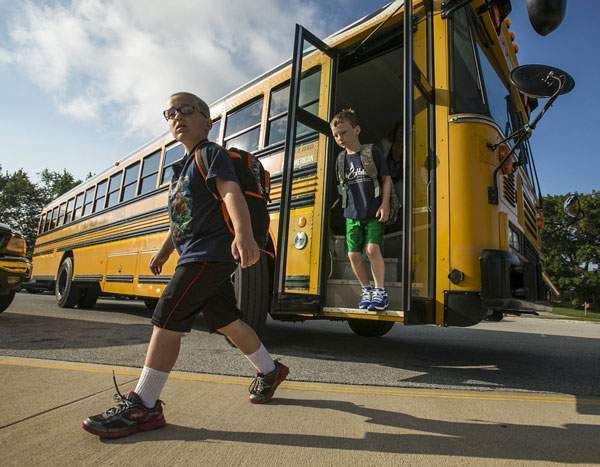 In Indiana, nearly 7,600 participating bus drivers reported 3,077 violations. FWCS bus drivers can document violations throughout the year but might not always have time to complete the form, Stockman said, noting drivers are busy ensuring students board the bus safely. Although the forms aren't forwarded to law enforcement – police won't write a ticket based on drivers' observations – the district has discussed ways to compile the data to help target enforcement, Stockman said.